Cottage on Blackbird Lane: Birthday girl! 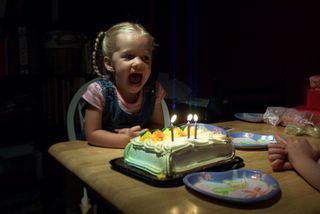 Today is Olivia's 3rd birthday. Three already. My little one is growing up so quickly. We will have a little celebration tonight and then a larger gathering this weekend. Olivia ready to wish for some more birthday fun! She is so excited about her party this weekend.